I have been reluctant to enter into mudwrestling events with debunkers and propagandists for what I see as blatant disinformation. I don't see these debates as productive. 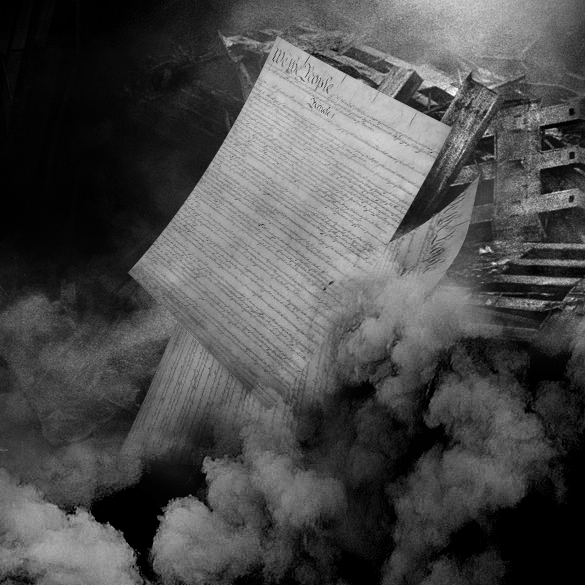 They are not about deepening the inquiry into events but rather fending off ever-morphing attacks by people who engage in deceptive argumentation. I have better uses for my time. I find that ignoring them works just as well and allows me to get on with my life. However one hit piece by Dave Thomas has been the source of repeated questions in my in-box from people who sense something is wrong with his analysis but are not confident enough of their grasp of the physics to be sure. Rather than continuing to write individual explanations in email responses I have now posted a refutation of the attack on the http://911SpeakOut.org "Articles and Links" page here: http://911speakout.org/wp-content/uploads/Response-to-Dave-Thomas.pdf. In June 2001, a contract was signed between the Port Authority of New York (still owner of the WTC but not for long) and the company EurekaGGN, through its subsidiary BRAM, to build a new communication network made of optical fibers in the twin towers from the basement to the 110TH floor. The works were sufficiently rapids compared to the size of the buildings. They were to be completed in the fall for WTC1 and on the 12/31 for the WTC2. There is no doubt that these works were well advanced during the months of July and August 2001. Since 1980, we have militarily intervened at least 35 times in more than 27 countries. We keep bombing, we continue spending trillions of dollars, but we're no safer as a result. David Hooper 2014 "The Anatomy of a Great Deception"
The Dallas area “North Texans for 9/11 Truth” Group performed a variety of actions in order to get the word out about 9/11 during September 2014. 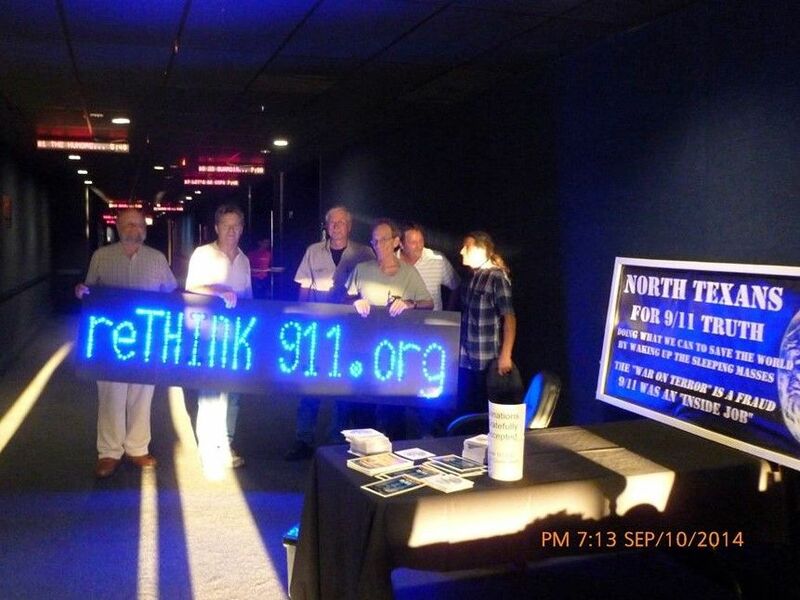 A real highlight in our actions was a battery powered LED, “ReThink911.org” banner which Stuart, one of our organizers, came up with. This banner is extremely visible from a distance during twilight or in the dark. The Truth trumps the darkness with this one. Coleen Rowley grew up in a small town in northeast Iowa. She obtained a B.A. degree in French from Wartburg College, Waverly, Iowa and then attended the College of Law at the University of Iowa and graduated with honors in 1980 also passing the Iowa Bar Exam that summer. In January of 1981, Rowley was appointed a Special Agent with the FBI and initially served in the Omaha, Nebraska and Jackson, Mississippi Divisions. In 1984 she was assigned to the New York Office and for over 6 years worked on Italian organized crime and Sicilian heroin drug investigations. During this time Rowley also served three separate temporary duty assignments in the Paris, France Embassy and Montreal Consulate. In 1990 Rowley was transferred to Minneapolis where she assumed the duties of "Chief Division Counsel" which entailed oversight of the Freedom of Information, Forfeiture, Victim-Witness and Community Outreach Programs as well as providing regular legal and ethics training to FBI Agents of the Division and some outside police training. In May of 2002 Rowley brought some of the pre 9-11 lapses to light and testified to the Senate Judiciary Committee about some of the endemic problems facing the FBI and the intelligence community. Rowley's memo to FBI Director Robert Mueller in connection with the Joint Intelligence Committee's Inquiry led to a two year long Department of Justice Inspector General investigation. She was one of three whistleblowers chosen as persons of the year by TIME magazine. In April 2003, following an unsuccessful and highly criticized attempt to warn the Director and other administration officials about the dangers of launching the invasion of Iraq, Rowley stepped down from her (GS-14) legal position to go back to being a (GS-13) FBI Special Agent. She retired from the FBI at the end of 2004 and now speaks publicly to various groups, ranging from school children to business/professional/civic groups, on two different topics: ethical decision-making and "civil liberties and effective investigation."